As a concept, Desertec was ambitious. Produce abundant clean electricity for Europe from vast concentrating solar power (CSP) plants in the deserts of North Africa and the Middle East. But after five years attempting to turn theory into practice, the Desertec Industrial Initiative (Dii), a consortium formed in 2009, is effectively dead in the water after being abandoned by the majority of its shareholders. Dii had pledged Desertec infrastructure would meet as much as 15% of Europe’s electricity needs by 2050. However, in October last year companies chose not to renew their contracts as part of the consortium. It’s a long way from 2011, when Dii said Desertec was “all systems go”. It was building a 500MW CSP plant in Morocco; it was in talks with Tunisia and Algeria to do the same, and from 2020 would “scale up” into Egypt, Libya, Syria, Saudi Arabia. All it needed was signatures on paperwork. The price tag matched the hype. At a cost of 400 billion euros (US$480 billion), Dii would conjure electricity from the deserts of the Middle East and North Africa (MENA) region, feeding it to Europe along high-voltage undersea cables beneath the Mediterranean. Dii estimated the region’s wind and solar potential at 800GW across 40,000 square kilometres. Big names such as Siemens, Bosch, E.On, HSBC, Morgan Stanley, Deutsche Bank and Munich Re signed up. At its height there were some 57 Dii shareholders from 16 countries, with Germany providing the most. But by late 2012, Siemens and Bosch had pulled out and now only three shareholders remain, to whom Dii will become a consultant: ACWA Power (Saudi Arabia), RWE (Germany) and the State Grid Corporation of China. SGCC joined up to learn more about transferring renewable power from China’s sparsely populated western regions to its populous and power-hungry coastal cities. Political instability clouded Desertec’s prospects. “The Arab Spring uprisings came at just the wrong time for Desertec. Energy security was always a worry, but suddenly it became a reality and investors got nervous,” says Dr Christopher Sansom of Cranfield University in Bedfordshire, an expert on CSP technology. With demand for energy in Africa as a whole far outstripping supply, the logic of generating electricity for Europe struck many as bizarre, if not positively postcolonial. At an energy conference in 2012, the vice-president of Algeria’s National Economic and Social Council also questioned whether European electricity prices would “give us a return on investments”. “It makes sense for the MENA countries to address their own supply issues before looking to export energy to Europe,” says Sansom. Other factors in sinking the project included lack of shareholder consensus on how the electricity should be produced, and which regions should benefit most, MENA or Europe. Quitting Dii in 2013, the not-for-profit Desertec Foundation - originator of the Desertec concept - cited “many irresolvable disputes ... in the area of future strategies, obligations and their communication”. Exporting power to Europe was central to the initial Desertec concept. However, obtaining declarations of intent from MENA and European governments proved so arduous that Dii reined in its ambitions. By June 2013, it was promising to meet only 10 per cent of Europe’s electricity needs by 2050 and was focusing more on power projects to benefit MENA countries. Dii chief executive Paul van Son said Europe’s infrastructure was not up to the job of receiving cheap renewable energy from MENA and criticised Europe’s “sleeping” leaders, who lacked a “sense of urgency” and “should build the infrastructure.” Van Son is departing for RWE in December 2014. The infrastructure and regulatory frameworks of key European countries turned out to be a poor fit with Dii’s ambitions as existing European grids are not robust enough to cope with surges of energy generation from weather-dependent renewables. Initially, Dii hoped to bring electricity into Europe through a cable between Morocco and Spain. But Spain was unwilling to tax its already overburdened national grid. In May, the Brussels-based grid association Entso-E warned that eight European countries might need to cut back on solar and wind generation when demand was low to prevent overloading the grid. Spain was particularly at risk, it warned, as its grid did not have enough capacity to export excess power. AbuBakr Bahaj, who heads the University of Southampton’s Energy and Climate Change Division, says super-grids optimised for existing centralised power generation and distribution are “currently not flexible enough” to cope with more energy from renewables at times of low demand. EU member states agreed in October to build them, at a likely cost of 125 billion euros over decades. Yet Europe has a growing need for more green energy and such issues could be dealt with by control and storage strategies, and eventually smart grids, he adds. He believes the Desertec concept is still a good one because it “competes head on with centralised power stations operating day and night,” could eventually lessen dependence on more-polluting power plants, and offers the additional benefit of providing energy to and power for desalination plants in Africa. But Desertec under Dii was also hobbled by its technology. In the years since Desertec was conceived, solar photovoltaic (PV) power, not CSP, has become the solar technology of choice. Solar panels are cheaper, simpler and can be used anywhere. CSP is expensive, complicated and many-parted (parabolic troughs heating liquid to produce steam that drives turbines), and relies on high levels of sun. The mirrored troughs also require a ready and plentiful supply of water for cleaning the mirrors and cooling. “It’s difficult not to conclude that at least part of the [Desertec] collapse is traceable to the low cost of PV, now much lower than CSP,” says solar energy expert Dr Richard Perez of the University at Albany, New York. Although CSP has a higher capacity for storing energy, the advantage of PV is that it “does not require pristine direct sun to function adequately, making it deployable everywhere and not only in arid locations,” says Perez. European countries, particularly Germany, were already invested in PV, which does not need the bright desert sun, around which the entire Desertec concept revolves. Indeed, responding to the launch of Dii in 2009, German parliamentarian Professor Hermann Scheer, who was chairman of the World Council for Renewable Energy at the time, called Desertec a mirage that its initiators knew had “no prospect of success.” Dii had chosen to ignore new technological possibilities for storing solar and wind power within Europe, he observed. Could the Desertec concept still have its day in the sun? After all, an International Energy Agency report concluded in October 2014 that solar power will achieve commercial “take-off” in the next decade and overtake fossil fuels as the world’s biggest source of electricity by 2050. The flagship CSP plant announced by Dii in 2011 is being built at last in the desert 200 kilometres from Marrakesh. However, it is being built by the Moroccan government to power Moroccan homes, as part of the country’s ambitious plans to produce 42 per cent of its electricity from solar, wind and hydroelectric by 2020. Similar plants are springing up in most MENA countries, creating a broad technological knowledge base, while the US SunShot initiative is expected to drive down the cost of CSP over the next five years. 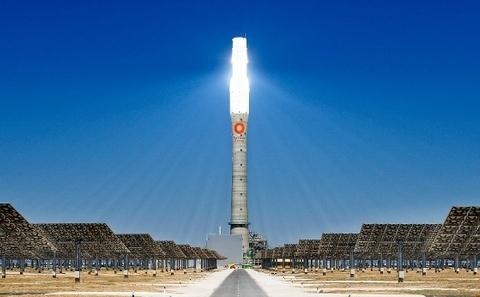 Meanwhile the TuNur project, a partnership that includes former Dii shareholder Nur Energie, announced in October 2014 that it will go ahead with plans for 10 CSP plants in Tunisia of 200MW each to feed power to Europe through Italy. TuNur is pure Desertec in concept, but like Desertec it needs to find backers, build plants and deal with the complexities and costs of feeding electricity into the European grid. Like Desertec it requires signatures on paperwork.